Gare Routiere is Geneva's central bus station for local and international destinations, serving over 100 buses daily. Buses to France, Spain, Italy, Maroco, Germany, Czech Republic, Austria, Slovakia, Poland, Bosnia, Serbia, Russia, Holland, Belgium and UK are daily departing and arriving from Gare Routiere. Also many excursions and tours are starting from here. 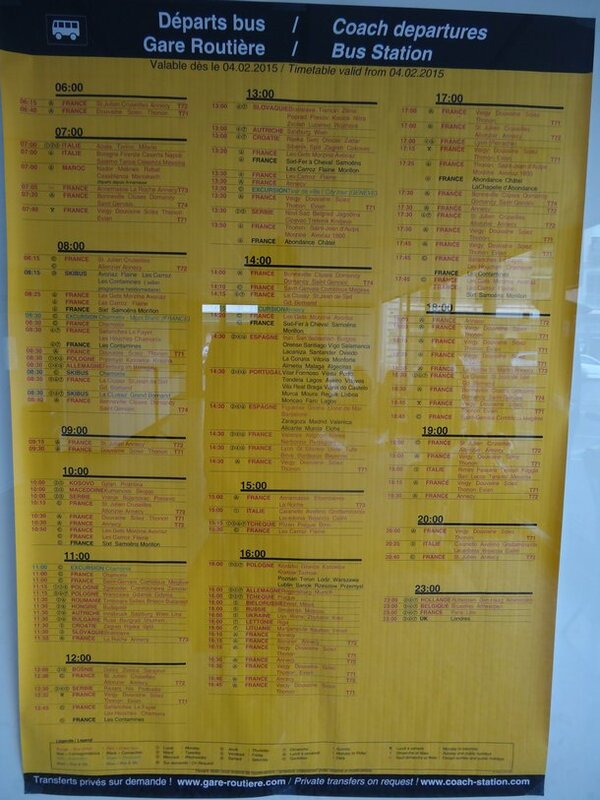 See the schedule of bus and coach departures from Gare Routiere bellow or view the picture of an original timetable. For the full list of bus departures, please see the included original picture. If You are searching for a public transport connection, the closest bus stop to Gare Routiere is Mont-Blanc. Geneva's central train station, Gare Cornavin, with much more public transport options is about 10 minutes by walking. Gare Routiere is located in the central part of Geneva, at the edge of Paquis district, only few minutes by walk to the Geneva Lake. Central train station Gare Cornavin is reachable in only 10 minutes walking distance via Rue du Mont-Blanc or Rue des Alpes (walk uphill), or by bus 9 and 25 (2 stops, 4 minutes). There are many small souvenir shops, restaurants and several good located Hotels around. In a simple but comfortable waiting room, where is also a ticket counter, you might have a cup of tea or coffee from the coffee machine and use the free toilet. There are two computers in the waiting hall where You can connect to internet for CHF 1.9 per hour.